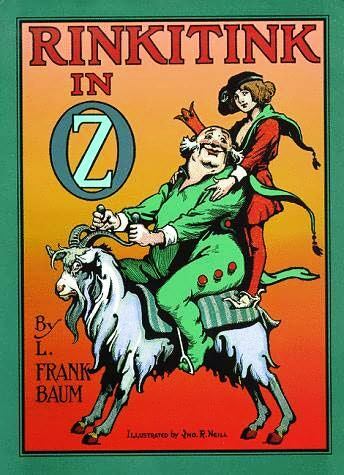 The twelfth book in Baum’s Oz series was The Tin Woodman of Oz and it was published in 1918. This was a surprisingly good book that actually has a very relevant title as opposed to a few other books in this series (I’m looking at you, Tik-Tok of Oz). And the book’s plot fills in a lot of back story to the original Wonderful Wizard of Oz. Ol’ Nick Chopper and The Wizard (he actually has no name and is only ever called The Wizard or Little Wizard) are telling tales in Chopper’s palace in the Winkie country. A wandering Gillikin boy named Woot arrives at the palace and begins asking how Tin Man became tin. Nick tells his origin in more detail about the witch Mombi cursing his axe and having his limbs cut off one by one. After each limb is cut off, he goes to a tinsmith friend of his named Ku-Klip to replace the limb until he was entirely made out of tin. After his accidents, Nick felt it wasn’t fair to marry his sweetheart, Nimmie Amee, since he didn’t truly love her any more due to not having a heart. So he leaves. This reminiscing causes Chopper to wonder what Amee is doing and to realize that he really should have married her like he promised. So Nick Chopper, the Scarecrow, the Wizard and Woot travel to Munchkinland to see if Amee will still marry the tin woodman. They meet lots of adventures on the way and even come upon another tin man in the munchkin forest. This new tin man was a soldier named Capt Fyter who also fell in love with Nimmie Amee and had his sword cursed by Mombi in the exact same way as Nick Chopper. Which of course led him to Ku-Klip. He was caught in the forest many years ago and rusted in a rain storm. Obviously shocked by the similar circumstances of their creation this leads the group to seek out Ku-Klip the tinsmith to discover the whereabouts of Nimmie Amee. They also discover that Ku-Klip used the cut off human body parts of Nick Chopper and the Tin Soldier to create another person, Chopfyt (combination of the two names Chopper and Fyter). From there they travel across Oz to where Nimmie currently resides to see if she wants to marry one of the tin men. Aside from the copious amounts of back story we get on Nick Chopper, we also get a lot of back story about the Land of Oz itself. We learn that Oz wasn’t always a magical fairyland in which no one ages or dies. We learn that a fairy queen named Lurline bestowed upon Oz the fairy status and left one of her fairies to be its guardian. That fairy is Ozma. This sort of flies in the face of the second book, Marvelous Land of Oz, in which it was said that Ozma was just a long lost royal who was rightly returned to her family’s throne. Regardless, I really like this new back story. It was interesting from the beginning and Baum had a few nice surprises in store. I also really liked meeting Ku-Klip, the tinsmith who created the Tin Woodman. 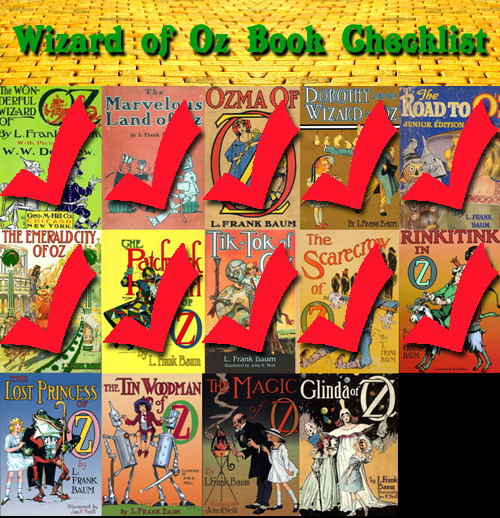 From what I’ve read, the Oz books had begun to decline in popularity right before this book, but it became a huge hit and started a resurgence in Oz popularity. It even carried over into some of Baum’s other non-Oz books like John Dough and the Cherub. Below is my checklist of Oz books. I’ve crossed off the ones I’ve currently read. Next up, The Magic of Oz. 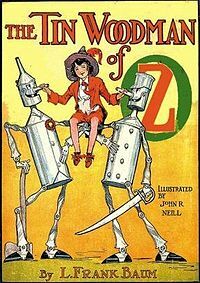 The tenth book of Oz was released in 1916. It was called Rinkitink in Oz. This book is an interesting entry in the series which makes for interesting reading. The bulk of this book was written 11 years prior to publication in 1905. It was intended as a separate fantasy story not a part of the main Oz books. This is clearly evident as you begin reading the book. I wasn’t aware of this fact, so when I started reading I kept checking to make sure I was reading the correct book. I had downloaded the eBook from Project Gutenberg and thought that maybe I had downloaded a book other than the one I intended. Nope, it was clearly Rinkitink in Oz. The story begins on the island of Pingaree. Many years prior to this story, the King of Pingaree repelled an invasion with the help of three magical pearls given to him by the Mermaids. Presently, the King passed down the secret of the pearls to his son, Inga. Just after, the island is again invaded by the two neighboring islands that had attacked before and this time they catch the King off guard and he can’t get to the pearls in time to save his people. The island is sacked and the people all become slaves. The only ones not taken into slavery are the prince, Inga, the visiting King Rinkitink of Gilgad and his surly goat, Bilbil. Inga retrieves the pearls from the wreckage of the castle, hides two of them in the toes of his shoes and places the third around his neck on a necklace. The motley group lead by Inga then heads off to the invading islands to free his parents and his people. What follows is a very entertaining story involving Inga and Rinkitink using the pearls to outwit and defeat the notorious armies of Regos and Coregos. After the first page or so mentioning where these lands are in relation to Oz, there is literally no mention of Oz again until the very end of the book. Inga discovers his parents have been put under the care of the newest Nome King, Kaliko, so he travels to the Nome King’s lands in Oz to retrieve them. After this a few other familiar faces show up and, even though I really liked the story, I thought it wrapped up a little too “neatly”. It’s like Baum had no ending and just shoe horned in some of his Oz characters as a deus ex machina. Overall, though, like I said this was a very entertaining story that went to several very fun places and incorporated some cool magic and fantasy elements. I’ll be interested to see if King Rinkitink, Inga or any of the Pingaree royal family show up again in the Baum Oz books, of which I now only have 4 left to read. Odds are, though, I’m guessing they won’t. Below is my checklist of Oz books. I’ve crossed off the ones I’ve currently read. Next up, The Lost Princess of Oz. So this week I’ve been looking at the 1992 Dream Team as this year is their 20th anniversary. On Monday I talked about their first appearance in the Tournament of Americas. On Thursday I looked at how that team had been merchandised and marketed to the world. 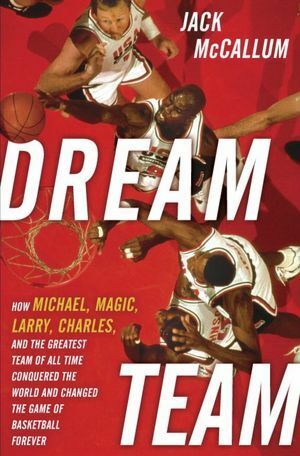 Today, I’m going to review a brand new book about the Dream Team that came out a week ago. It’s a behind the scenes book written by Sports Illustrated writer Jack McCallum. The book is titled simply, Dream Team. On the surface, this book is similar to another book that was released in 1993 called The Golden Boys by Cameron Stauth. Like Stauth, McCallum was a reporter that hung around the Dream Team at the time of the 1992 Olympics. McCallum gathered his notes and interviews with an eye towards releasing his book, like Stauth, right after the team won gold. Unlike Stauth, McCallum’s book deal fell through. McCallum kept those notes, however, and used them to write this new book. And he supplemented it with new interviews. 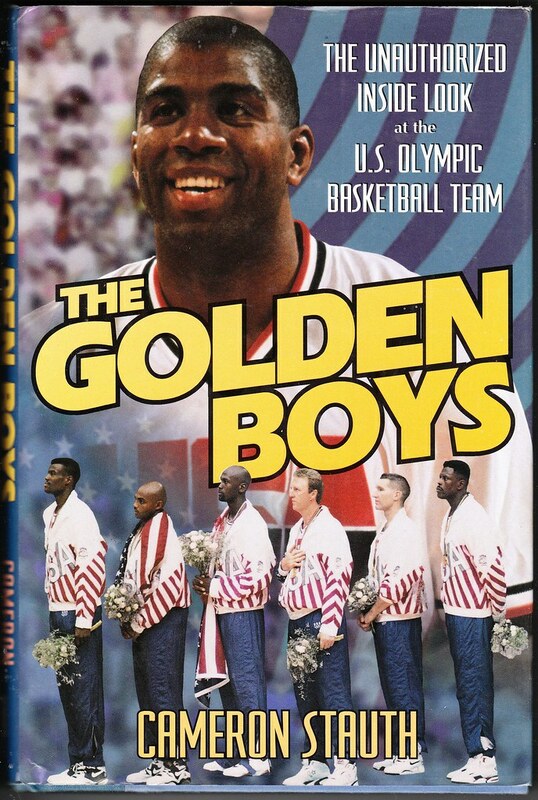 Unlike Stauth, however, since this new book is being released 20 years later, he can get some perspective on the 12 man circus that was known as the original Dream Team. None of these guys are still active in the NBA. Twenty years makes people a lot more comfortable about revealing what really went on. In Stauth’s book, you weren’t going to get the honest truth so close to the situation (except from, maybe, Charles Barkley). With McCallum, new interviews with the members of the team and the officials/executives that made the team happen are much more candid. People now are much more willing to talk about the behind the scenes machinations that made this team. And this is why McCallum’s book is endorsed by the NBA and Team USA and Stauth’s book was not. Case in point, the controversy surrounding the exclusion of Detroit Pistons point guard, Isiah Thomas. McCallum covers this topic at length. It’s very interesting what everyone has to say about this. Essentially, it comes down to Thomas really keeping himself off the team, but, there were definitely people that didn’t want him there. Players and executives. I didn’t make the team? !